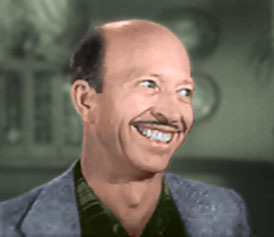 Frank Cady appeared in high school plays and studied drama at college, putting himself through school by working as an errand boy and reporter at his home town's newspaper, The Lassen County Advocate, in Susanville, California. After graduating, he worked on the London stage, and in 1938 he appeared in one of the earliest BBC productions of Shakespeare for television. He was already bald when he appeared in his first film, 1947's Violence, a low-budget no-star thriller. In his many films, Cady never played the lead, and he was usually far down in the credits. In Hitchcock's classic Rear Window with Jimmy Stewart, Cady played a neighbor on the fire escape. Through the 1950s he often worked on radio dramas, mostly performing his artificial hick accent for westerns like Gunsmoke, Fort Laramie, and Have Gun Will Travel. For ten of the fourteen years of The Adventures of Ozzie & Harriet, he played the neighbor, Doc Williams. Cady also appeared with Ozzie & Harriet in a long-running commercial for Coca-Cola, wherein a steak cook-out goes awry. Cady was best known as Sam Drucker on the 1960s sitcoms Petticoat Junction and Green Acres, and appeared as Drucker a handful of times on The Beverly Hillbillies, all set in the same fictional universe. Drucker was the small-town grocer, postmaster, and publisher of the local paper, the Hooterville World Guardian. Local characters literally gathered at his store's pickle barrel, and as the postman he provided the only clue to the town's location, when he once mentioned that Hooterville's zip code was 40516½, which would put it in Kentucky. After spending most of the 1960s dispensing folksy wisdom, Cady and his castmates were thrown out of work when, despite high ratings, TV magnate Fred Silverman cancelled all of CBS' "rural shows" in 1971. After that, Cady was offered almost nothing but "shopkeeper" roles, most of which he declined. In the late 1970s he spent four years as pitchman for Ralston Purina dog food. When that contract ended he retired to Oregon, where he died in 2012.